With Thanksgiving a few days away, and Christmas quickly approaching, I thought some Blog Candy was in order to help kick off the Holiday Shopping Frenzy! But before I get to the Blog Candy - I want to share today's TJ Blogstravaganza post. 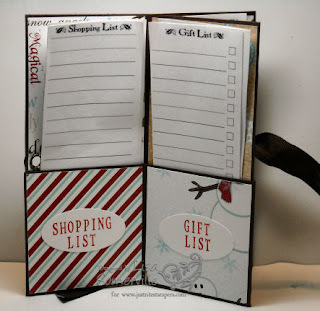 Pat had recently posted a great tutorial on making a Holiday Planner - not having any file folders in the house, I wanted to make mine with product I had at hand, and I wanted mine to fit nicely inside my purse. So....I used her tutorial as a guide and set out to create my project. I started with a piece of card stock that was 10" x 8", using my Scor-Pal, I score my card stock at 2-1/2", 5" and 7-1/2", then rotated my card stock and scored at 2-1/2" (this will be the flap that folds up). The printed sheets inside my planner can be found here, just print them out and cut them to size - how easy is that! The designer paper used in my planner can be found here, I cut these panels to 4-7/8" 2-3/8"(you'll need 5). Leave 1 piece that size for the front cover, then take the remaining 4 panels and cut off a piece that is 2-3/8" x 2-3/8", the smaller panels get placed on the pockets, the larger panels on the top half. I added a Jumbo Eyelet to the left and right page of the planner so that I could tie on my Chocolate Grosgrain. I also used sticky strip to adhere page two to page 3, so it opens like a book. To create the words for the front and inside of my planner - I used my JustRite Harmony Rectangular Stamper Set and Times New Roman Paper Crafting Font (25pt), I stamped them in Riding Hood Red ink on white card stock, then punched them out with my SU Large Oval punch, and placed them on the inside pages of my planner. For the one I used on the front cover, I adhered my stamped oval to a piece of Riding Hood Red punched circled and a punched Chocolate Chip Wide Oval, inserted my silver brads, then adhered to the cover using dimensionals. I love the JustRite Fonts and Harmony Stamper set, because my options are limitless for creating words or sentiments! 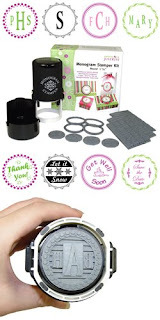 As a thank you to my blog readers, I'm giving one JustRite Monogram Self-Inking Stamper Kit 1 5/8"! To enter, simply leave me a comment here on this post and let me know which of the TJ Blogstravaganza projects I've posted so far is your favorite. Be sure to leave your comment by 11PM on Sunday, November 30th. I'll have the random number generator pick the winner and post it here on my blog on Monday. Please remember, you need to check back to see if you've won, as Blogger does not store email addresses for all posters. One comment per person, please. Hi Lisa! I really love that Santa Ornament! But that Framed Snowman is my Favorite! That is so gorgeous!! Would love to receive that as a Christmas gift! Great adaption Lisa. Very nice project. Thanks for the link to print the inserts. Yummy blog candy--thanks for the opp to win. What a fun project, and what a FABULOUS giveaway! Would love to one of these self-inking ones so I could crank out multiples. Thanks for the chance! My fav is the paper weight. It is unique and elegant. Great projects. I really love the paperweights. They are a great gift item. This is an excellent planner!! I love the paperweight, the nesties faux rim card, heck I just love all the things you have shared. Actually, the chocolate suckers in the pail. I just got that set from JustRite and have yet to ink them up!! I would love to have a chance to win your blog candy, Lisa!! My favorite project is definitely the holiday planner! Being the mother of 14 children, my purse during the holidays is a train wreck full of list, receipts and more receipts! This would be so great for me to organize it all! Great design!!! I think if I have to pick a favorite, it would be the Joy to the World card. I love that image and the way you used the black and blue is SO striking! Gorgeous! I love the Jar with the Decor Element on the front. I am going to make one to put christmas cookies in and give away as gifts to co-workers. My favorite though is the Santa ornament. It's gorgeous and the ribbon you used throws it over the top. I love the Holiday Planner but I like all of them. I can use them for all occasions just by changing the stamps. I love the tutorials! I really like this planner. Had not seen one of these before and I think it is great! I enjoy getting your blog and your great ideas. Keep it up. Happy Thanksgiving!! Beautiful planner and what a cute stamp set. Please enter me in the drawing. This by far is my very favorite blogstravaganza project mainly because during the holidays and our endless list of things to do, having some sort of way to organize it all is the ONLY way to make sure it all gets done. Your planner/organizer for the holidays is 'da bomb! I love the holiday tin with the chocolate on the sticks. A close second would be the planner. I really need to make me one of those. Just ordered my first sets of JR stamps so I would love to win these. Thanks for sharing all your great projects. Hi Lisa. It is ahrd to really pick a favorite. I love all that you do....but,if I had to pick,I would pick the paper piecing one you did with the snowmen card. I love snowmen and that one is so cute.TFS!!! i've just started viewing your site so I'm a little behind, but I really liked the paper piecing snowmen! Lisa, I loved the ornament, but my favorite is the holiday planner. I made several of these for a swap during the summer with the file folders and it was a nightmare. They turned out great, but were such a chore. I think the ones you have done with the cardstock would be much easier. thanks so much for offering the candy, I have wanted these for a long time, but never had the extra cash to order them. Your planner is wonderful! I've been just itching to use those JustRite stamps. They look to have so many uses! thanks for the blog candy opportunity and all the inspiration! I can't decide which I like better in the TJ Blogstravaganza but I would have to pick the Holiday planner. Would love to receive it for Christmas. I love all your projects but I like the organizer the best. Great blog candy also. That would make a perfect Christmas gift. My favorite is the paper pieced Holiday Lineup. Too Cute! Love that blog candy too. Please enter me in the drawing. Thanks! Hi -- I do love the santa ornament, but my love of lists and paper organizing, I do also like the holiday planner. Thanks for the offer of this giveaway. I have been wanting to get one of these for months now. Oh my...the holiday planner is fabulous! I have Just Rite on my wish list! Wow! Your projects have really been a source of inspiration, but my favorites are the CD holder and the chocolate tin. This is a really generous giveaway. Good luck to everyone! I just found your blog a week ago and I am loving it. I made these planners last year, but I like that this one is purse sized. The stamps you used are adorable. I love all the projects!! I really like the planner, though. I want to make one for myself and other family members! What great projects...but my favorite is this planner. I was just getting ready to sit down and make one. I love the Holiday Lineup paper piecing snowmen too..so sweet and great colors! You have been such an inspiration this Christmas, with so many helpful ideas - thank you so much. My favourite is the holiday planner - I will make one, and hope that as I'm doing it I will be inspired with gift ideas etc. What awesome blog candy! Wow! You have had so many wonderful projects, so it's hard to say which one is my favourite! at the present time, I would have to say that the paper pieced Snowmen is one of my favourites! Thanks for a chance to win an this awesome candy!! Well, besides today's holiday planner and all the rest, I really love the look of the bucket of chocolate suckers. I've been drooling over all the JustRite projects and hope to be able to get some of the stamps someday! Thanks for the chance to get started! Happy Thanksgiving! so many of your projects are great for the holidays - but I think my over-all favorite are the Paper Weights - what grand gifts they are! great planner..love how you made with what you had on hand..have been thinking about getting one of the monogram stamps..Hope you and your family have a HAPPY THANKSGIVING!! I really love today's planner the best, but have to admit that I'd be more likely to do the Santa ornament because is looks less time-consuming at this point! Great job! Thanks so much for the chance to win! Just found your blog, you do great work, and have already given me several ideas. Happy Holidays! Lisa, your planner is so cute! I really don't know how you do it all, you're so prolific! It amazes me how much you share with us all! 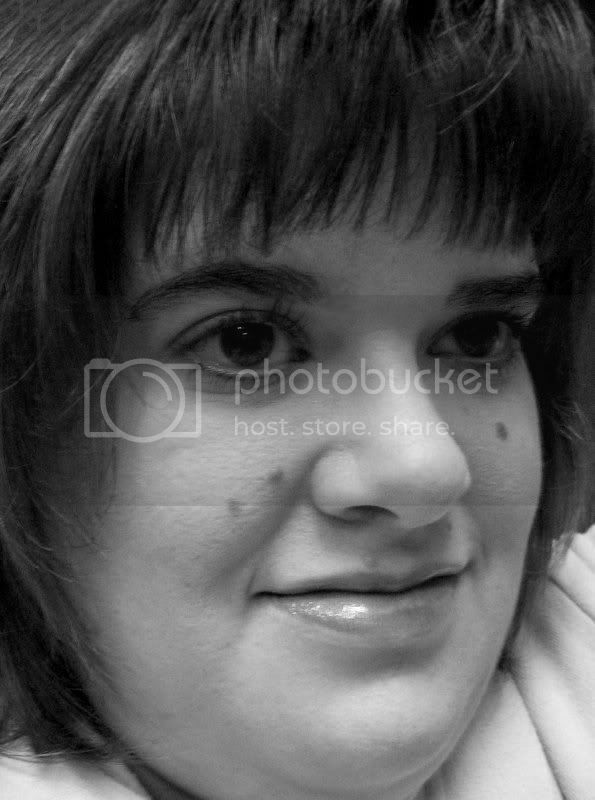 Hi Lisa, I love the the one you just posted! What a creative way to do your planning. I have been wanting that Justright Monagramer for a while now! Hope I win! Of course all of your projects ROCK! I like the CD holder & the Planner & Home for the Holidays but my favorite is the SCS202 Joy to the World card. It's stunning w/the black & blue that brings out the focal point. What awesome holiday blog candy! Thanks Lisa for a chance to win these jewels!! Oh, my! I guess I'd have to say the Season's Greetings card with the Holiday Lineup image. Those snowmen are just too cute! Thanks for a chance to win! I've been enjoying all your blogstravaganza projects Lisa! I think my favourite is the Santa glass ornament! Just found your blog and love it! Thank you for taking time to share! I like the holiday planner. Keeps everything neat and organized. Great blog candy. I love all your projects, wonderful creativity but the holiday planner is my favorite and I can imagine it converted to planners for other times of the year like school time and summer vacation. Great giveaway also. thanks for all inspiration. While I always enjoy all the things that you post, my favorite is the planner. My purse is always a mess even though I clean it out regularly and have good intentions. During the holidays it's even more of a mess so a planner would really help me out. Thank you for inpsiring me and happy holidays to you and your loved ones. 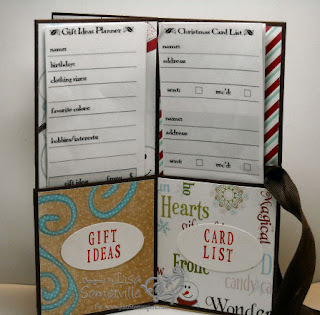 There have been so many wonderful projects... too many to choose from, but I really like this holiday planner. Thanks for the blog candy... I can already think of several new projects I could use it with. As always your creativity amazes me. My favorite is the pail of chocolate suckers. That is so cute! Thanks for the opportunity to win a Just Rite Stamper. My favorite project is Nesties Faux Rim Mini Tutorial card. That is just too cute. The framed Santa is lovely, truly but I also LOVE the snowman card. The paper piecing is adorable! My favorite is the Santa ornament. Wow, it is just gorgeous! You have some beautiful projects on your blog. I like this one - I also didn't have any manila folders in the house and was wondering where I could snitch some! But why not just use cardstock!! Genius! I like all your projects but my fav is the Santa ornament. So vintage looking. i just LOVE this pocket planner the best. 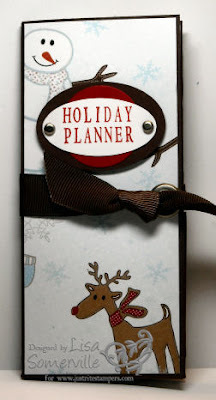 don't get me wrong; your paper pieced snowman, cd holder, and chocolate tin are VERY cute too, but i just love the idea of a planner to keep all my thoughts from falling out of my brain :) thnx for sharing, and for the great blog treat give away. Hi Lisa, I have enjoyed all of your projects so far, but my favorite is the Paper Piecing with the snowmen group -- so cute. Would love to try out the products from JustRite. Hi Lisa The Santa ornament is my favorite. Of course, I love all the others too. Thanks for posting them for us. Since I have this set, I have to pick the paper pieced Holiday Lineup. Please enter me in the drawing. I would love to win a JustRite stamper. Thanks for the chance. I like the Holiday Line up the best. And the best part of it is that my daughter has this set and I have my dibs on it to make this!! Oh how a great plan comes together!!!! LOL Thanks so much. I would love this stamper. Wow! What a great blog candy!!! I really like the jumbo tag idea. Your sample is beautiful. My mind is reeling with lots of ideas using that jumbo tag. It is hard to pick just one--I like all your cards made with the ODBD stamps but my favorite project is the paperweights since they would make such great gifts. I really like the broken gingerbread card with the cute sentiment inside! All your projects are great! I love the faux rim tutorial!!! Awesome.. gonna try it too! Thanks for the opportunity of blog candy!!! I love the card using Labels II. I've been contemplating acquiring this set...now I'll have to. Thanks for such fantastic inspiration. I think my fave so far is your version of the planner!! Hi Lisa, The holiday planner is my favorite. Thats so generous of you to giveaway a gift like that. Thank you for the opportunity to win some wonderful candy! I love the paper pieced card! So cute! I love the Planner. I have made a couple. But I think I like the card with the Paper trey house the best! I LOVED the planner!! I can't wait to try this one...it will make wonderful gifts, so please enter me in the blog candy drawing. LOVE the planner, what a great idea!! I plan to TRY to make some for gifts this holiday season. Please enter me for the candy drawing. Hi Lisa! I'd love to see instructions on your "folded tree" that you submitted to TJunkies. Would also love to win this blog candy you're giving away. I've been wanting this, but have been to poor to buy it.